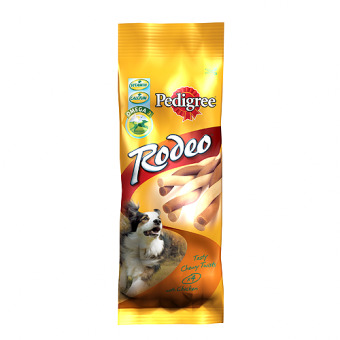 Pedigree Rodeo is a delicious and unique treat for your dog. With its satisfying, chewy texture, its unique twisted shape and irresistible meaty taste, it will give your dog longer lasting enjoyment. Pedigree Rodeo is an ideal way to reward your dog, or simply show him how much you love him.